Product Consists: Set of 2 Threads of Velvet Beads with Diamond Studded Tiny Rings Rakhi. 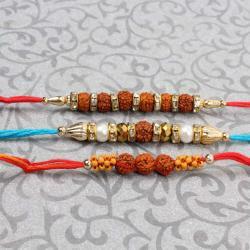 If you want to celebrate Rakhi in the best way, the festival which is considered as the most important festival to celebrate sibling love, most of the online and retail store takes special steps to design special rakhi for making your celebration complete. From online, you can find out your most favorite deigns to buy. 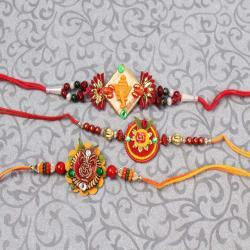 By presenting the rakhi, you will be able to bring out the smile and happiness on the receivers face. Hence, you have to go with the Set of Two Velvet Touch Rakhi to present to your loveable brothers. When you come online, you can get a special discount by ordering for the rakhi festival. 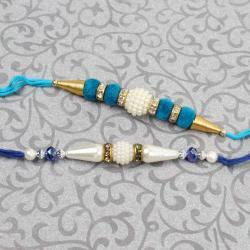 Product Consists: Set of 2 Threads of Velvet Beads with Diamond Studded Tiny Rings Rakhi.